An interface is a list of methods, properties, events and indexers that a class may implement. All methods, properties and events defined in the interface are implicitly instance members, rather than static members. Events can be static events or instance events. Static events are associated with the class as a whole, whereas instance events are associated with a specific instance of the class. You can attach event handlers to both static and instance events. In both cases, we’re attaching a handler that is a static method. We can also attach a handler that is an instance method. So we can attach both static and instance methods as handlers, to either static or instance events. Although constants can be treated as static member variables, you cannot include the static keyword when declaring a constant. A constant is always effectively static, so the static keyword would be redundant. The compiler will generate an error if you include it. Like instance methods and properties, you can define the accessibility of static methods and properties using access modifiers. 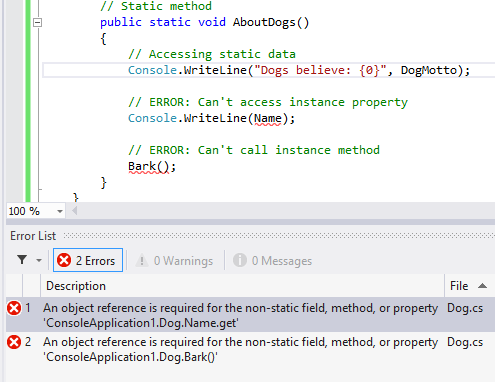 As with instance members, access modifiers on static members indicates what code has access to the member. A static method in a class is similar to an instance method, except that it acts upon the class’ static data–fields and properties–rather than on the instance data stored with a single instance of the class. There is only one copy of each static data item, no matter how many instances of the class exist. Here’s an example of defining a static method in a class. To call a static method, you just prefix the method with the name of the class (rather than with a reference to an instance of the class).